Watch dolphins play and stingrays soar from your private balcony! Majestic Beach is one of the new premier resorts in the new panama city beach! Welcome to our family vacation home. We are honored to have you. Our goal is to provide you with wonderful family memories that last a lifetime! 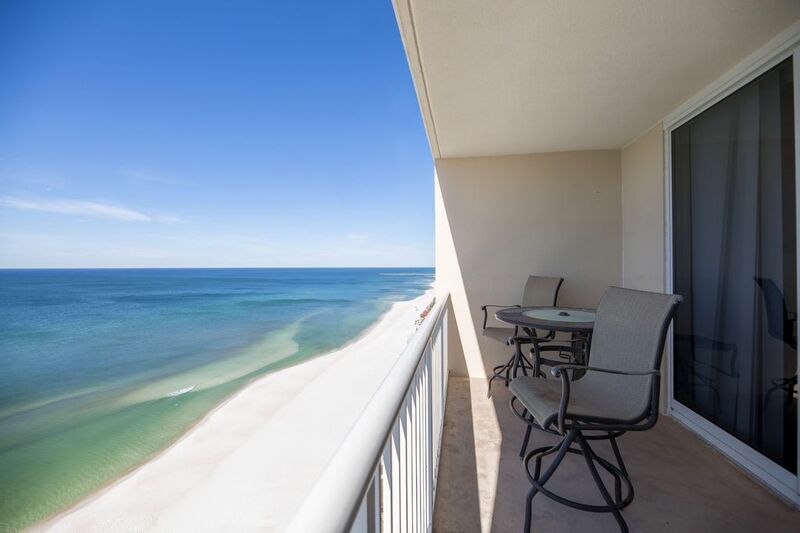 We are directly on the beach overlooking the sugar white sands and emerald green waters of Panama City Beach. Our spacious studio deluxe has plenty of room for up to 4 guests. You can bring a blow up mattress for more people if needed. There is a full bed and a bunk room that has 2 beds that are big enough adults. The kitchen is fully equipped with all the amenities of home. We have a washer/dryer in the unit. Cable TV/DVD and plenty of board games for your entertainment. Our studio deluxe is larger than the regular studio; the kitchen and living area are separated by a full sit up bar. Our condo is situated on the 18th floor. You can watch all the activities from the balcony. The breathtaking views are amazing. USA Today rated TOP 5 Beaches in the world. You are minutes away from Ripley’s Believe It or Not, Pier Park, Gulf World, Fishing, Dolphin Encounters, Shell Island, Miniature Golf, Go Karts, Arcades, and Championship Golf Courses, Shopping, and Dozens of Restaurants. Come melt the stress away by the pools and have the waitress bring your cocktails and dinner. Women will enjoy the resort spa receiving facials and a much needed massage. Watch first run movies in the stadium seating theatre, pick up all your basic needs at Majestic Market where you can buy anything that you would get at a general store from beach supplies, sandwiches, soft drinks, and don’t forget to pick up your favorite star bucks beverage while you are there. Rent jet skis and banana boats directly behind the resort. Have the pizza shop prepare your pizza just the way you like it and have it delivered to your door. Come enjoy our 5 star resort at a 2 star price. We have great rates and since we just bought the condo we also have many open dates right now. Great accommodations and a perfect location.!!! It's a nice, affordable place for a young family with bunk beds and a queen bed. No way to grill. Only a shower. Great place for a family! The amenities are wonderful and the room was great! Such a nice vacation- looking forward to going back!!! This condo is in a great location with a perfect view or the ocean. It was very clean when we got there. Really the only two things we didn’t enjoy about our stay, and they are minor things, were the elevators seem to take forever and stop on every floor, also the system to get a luggage cart seemed to be more trouble than it was worth for us. However we could not have asked for a better condo. We really enjoyed our stay. We loved this unit. We only had two people but will definitely come back with our two kids! Everything was very clean in the condo and around the resort. We will definitely stay here again! Only bad thing was the blinds are broken and missing a couple blinds.